It’s been quite a week for aliens it has to be said. Hitting the headlines throughout the week in the more scientifically flexible nebulae of the tabloid press, the extra terrestrial community hasn’t enjoyed quite such a flurry of fame in years. First up we had of course – the Bilderberg Group. To most, they are unaccountable grey men in suits lobbying one another for suspect ends, but to David Icke and his mates, they are actually shape shifting reptilians from outer space who are controlling our world and abusing our children. Nothing like some understated, well researched, fact founded criticism to win an argument eh? Perhaps it was one of their transport saucers that a Chinese plane crashed into. After an emergency landing and a dented nose cone, ‘experts’ – and we use that term in the loosest possible sense - decided that and Air China flight may have impacted a UFO. None of these experts were apparently Chinese – or experts, and appear largely to have been the resident nutters on The Sun’s speed dial. Air China declined to comment, which probably means they are aliens with something to hide. And finally this week – mysterious flying disks were spotted over the UK Scientology HQ. The Hubbard brigade are based in glamorous hotspot, East Grinstead, which happens to be on the flight path to Gatwick. 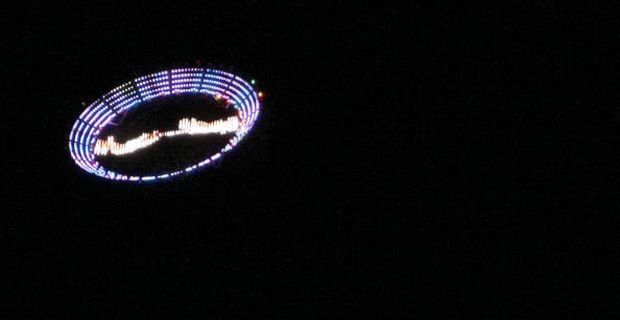 The UFOs were spotted by pilots landing at the airport, one of whom described what he saw as “man-made” and “toy-like”. The chance of them being a suitably bizarre bid for mystique by the alien believing cult has thus far been overlooked. Because they wouldn’t resort to elaborate stunts to get members. Far more likely that they have been right all along.